Democratic nominee Hillary Clinton and Republican nominee Donald Trump arrive on stage during the second presidential debate at Washington University in St. Louis, Missouri on Sunday. 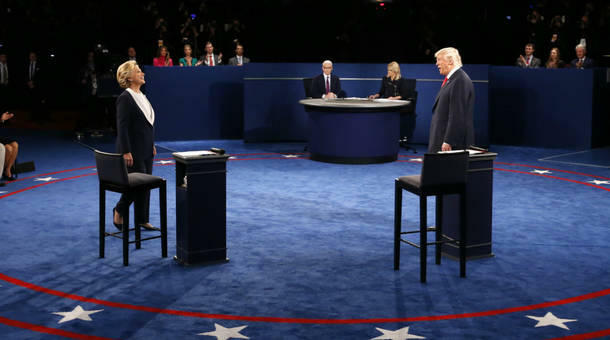 Many voters might have been left bewildered by the claims and counter claims of the presidential candidates about their tax plans during last night's debate. We're cutting taxes for the middle class, and I will tell you, we are cutting them big league for the middle class. And I will tell you, Hillary Clinton is raising your taxes, folks. You can look at me. She's raising your taxes really high. Trump is correct in that when he says he would cut taxes for everyone, he would cut the tax rates for everyone. But according to the conservative Tax Foundation, most of the benefits of those tax cuts would end up going to the wealthiest Americans, given all the deductions, credits and other changes to the tax code that the Trump plan suggests. The nonpartisan Tax Policy Center said some middle-class families would actually end up paying more under Trump's plan because of limits on certain kinds of deductions. Nobody who makes less than $250,000 a year — and that's the vast majority of Americans as you know — will have their taxes raised. Because I think we've got to go where the money is. And the money is with people who've taken advantage of every single break in the tax code. The actual amount of taxes might creep up a little bit for many, many people under Clinton's plan. But the Tax Policy Center said that almost all of the major tax increases would hit the wealthiest 5 percent of Americans, and not the middle class. So how much will these plans costs? The Tax Foundation said the Trump plan would cost about $4.4 trillion to almost $6 trillion over a decade. Meanwhile, Clinton's plan would actually increase federal revenues by about $1 trillion over a decade, according to the Tax Policy Center.